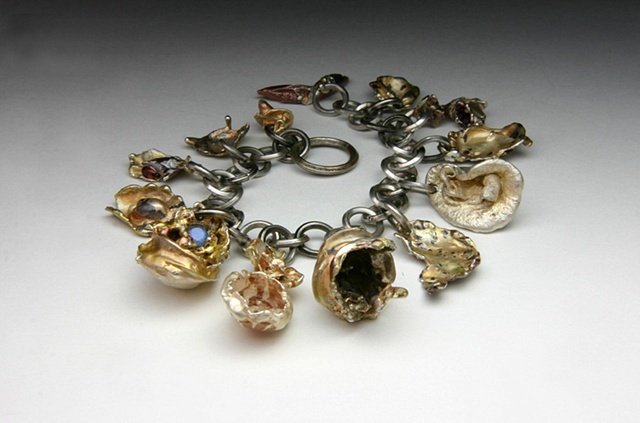 Alchemists Charm Bracelet in sterling silver with Gems by Jewels Curnow. These charms don't mean anything in particular but the colors hint at the Alchemist idea of transmuting one metal to another. I think the real secret to this idea is preserving sacred proportions, geometry and symbols in base metals, stone and ceramics that have no value as a raw material. Adding a decorative design that includes the golden ratio makes a lump of lead or iron into "Gold" that people are not likely to melt down to "cash it in" thus preserving this information longer (think about all of the Mayan sacred art made out of Gold that got melted down by the Spaniards, that information is lost forever). I like the fluidity of the charms on the very regular and angular structure of the milled links that make up the chain. The other thing I like about this piece is the sounds it makes when handled or worn; most of the charms sound like silver bells. I used Fire, Water and Gravity to make this bracelet. The links are 10mm (3/8"), the longest charm is 32mm (1 1/4"), the shortest charm is 13mm (1/2") and there are 6 faceted gems ranging from 2mm to 5.5mm. They are 1 bright green Tsavorite Garnet, 2 pale green Sapphires, one orange/red oval Hessonite Garnet, 1 red Almandine Garnet and 1 Labradorite Feldspar. SIZE: It will fit up to a 7" wrist and I can easily add or subtract links to fit any size; each link adds 1/4". Contact me before purchasing if you want it adjusted.